Naturally, rectification of space is also indispensable. This technology is based on the application of the rectifying element that strengthens EM rectification power. That is, a smokeless carbonizer equipped with an EM gravitron rectifying sticker (element) makes coal with strong rectifying power (see issue #115). Mix the charcoal, salt and soil in equal amounts, add activated EM solution cultured with seawater, mix it carefully, and make rectified mudballs of baseball size. Bury (or embed) the rectified mudballs at a depth of 30 to 50 cm in the four corners of a field or greenhouse, and bury them at both ends of the ridges, to strengthen the rectifying power of the entire field. In principle, charcoal acts as a semiconductor, and salt’s role to carry its rectified energy superconductively. In other words, rectifying the space above and the ground below as a set enhances the resonance effect and works to strengthen the coherent (quantum beat). Therefore, the resonance power of EM in the field is increased and the atomic conversion power is also strengthened. We need to carry out this idea thoroughly. In this way, when rectifying the energy of the soil and space and raising the population of EM within that boundary, the limit breakthrough we have seen becomes an ultimate limit breakthrough. Therefore, increasing the amount of salt to be applied to 2 tons per 1,000 m2 won’t damage anything and the limits are unknown. In short, it is about how to use salt with the yield target in mind. In the case of rice production, we think that about 30 to 40 bales (1.8 to 2.4 tons) per 1,000 m2 possible. Rice farmers hope to exceed 10 bales, and producing 3 to 4 times that sounds almost ridiculous, but there is a basis for this. As shown in pages 83-85 of my book, Utilization of Microorganisms in Agriculture and Environmental Conservation (Published by Nobunkyo in 1991), it is experimental, but if you increase the population of EM by rotation with wheat production and there is an appropriate amount of organic matter, yield reached 27.6 bales per 1,000 m2. This empirical possibility has been confirmed several times afterwards, however, it was around the time when a policy of reducing rice cultivation acreage became severe due to the overproduction of rice, and a system of enabling high quality EM to be administered in large quantities was not in place, so it ended up just in the realm of the possible. However, I have not given up. This is because I believe it is relatively easy to achieve if we take into consideration the technology described above. per 1,000 m2 as a secondary crop. Upon reaching this level, it is comparable to the best oil field that never runs out. 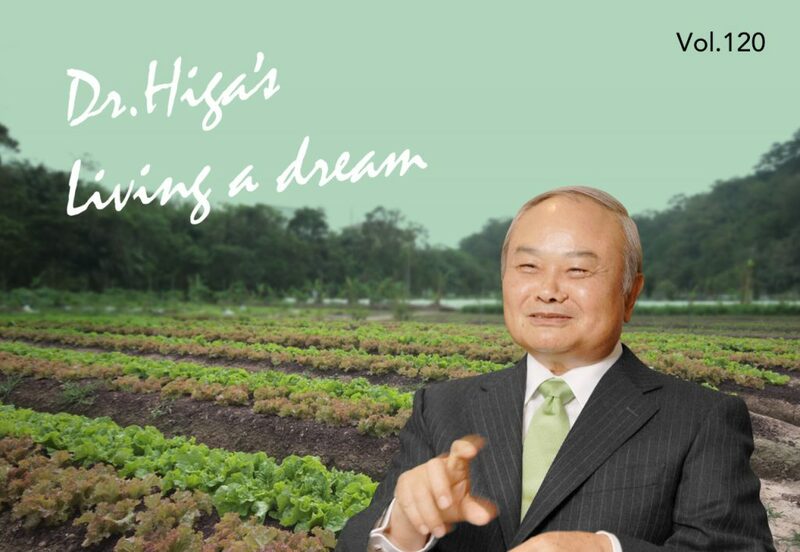 That is, CO2 in the atmosphere becomes an infinite resource, through fermentation technology harvested products can be made into raw materials for all types of plastics industries, and a source of hydrogen energy, and rice husks and so on can be utilized as high-performance carbon material or feed. Moreover, by utilizing smokeless carbonizers and universal carbonization machines, not only plastic and rubber, but also all organic waste are converted to highly functional charcoal, and it is possible to make it as functional material for biological production, environmental conservation, and civil engineering construction. As a result, the carbon dioxide gas is fixed and will not be discharged into the air again, leading to the conclusion that fundamental measures against global warming are possible. As mentioned earlier, salt is used in conjunction with rectifying coal, on the assumption that EM function will be further enhanced with respect to rectification of the part above ground and the part below. Therefore, when using a large amount of salt, the level of this balance is important. In other words, applying a large amount of salt when the population of EM is insufficiently high will cause the situation to go from excellent to very poor. When applying a large amount of salt, even if there is sufficient rainfall (10mm) or sufficient irrigation has been carried out, the only clear criterion is to refer to EC (Electrical Conductivity) measurements. When using a large amount of salt of more than 500 kg per 1,000 m2, it is necessary to refer to the general salt tolerance of the crop shown in the table below, but even if we use EM, salt damage may occur if the EC is two to three times that value. 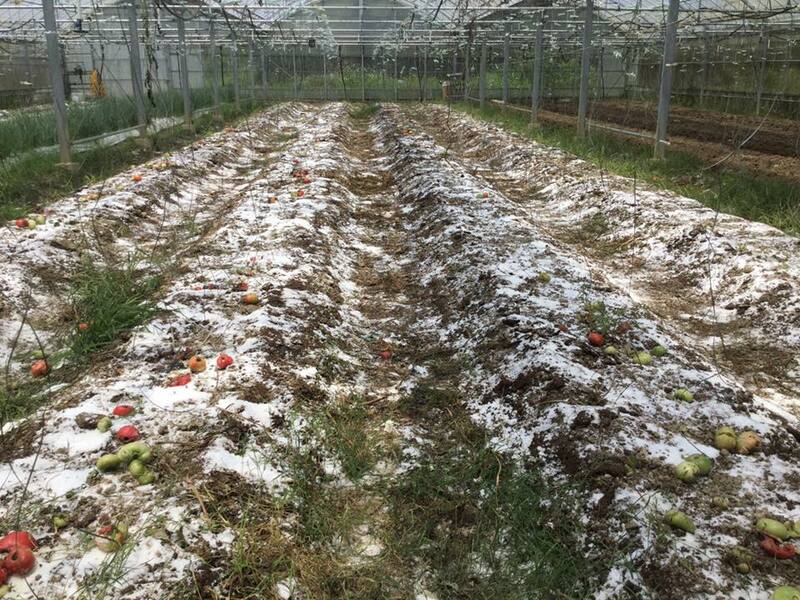 Photo 1 shows the condition at EM Research Organization’s Sunshine Farm, in which two tons of salt was sprinkled per 1,000 m2 for soil disinfection, weed control and soil improvement. It looks like snow is piled up, but after that, we will irrigate with the activated EM solution and adjust the EC to about twice the standard value and then plant. Photo 2 shows the particle size of salt. The price of the powdered salt on the left is around ¥30,000 per ton, which is convenient to use for weeding when crops are not planted. 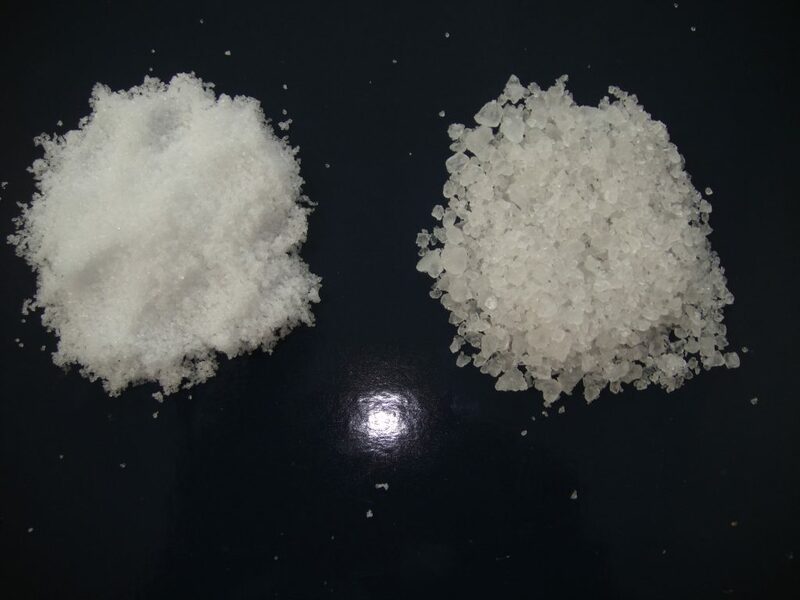 The price of medium granular salt *on the right is around ¥40,000 per ton, and it will be used when applying salt as supplementary fertilizer. Powdery salt dissolves quickly, so there is a concern that salt damage may occur, and moreover, if it rains, it will run off quickly. On the other hand, since the medium granular salt dissolves gradually, in ordinary application amounts (100 kg per 1,000 m2) salt damage will occur only in rare instances. If it is applied more than 5cm away from crops and applied evenly, all the seeds of the weeds on the surface will die away, so it also remarkably effective in weed control. In order to increase the population of EM, make sure to continue to apply the activated EM solution cultivated with seawater; its effect is even more noticeable when organic matter is used in combination. Organic matter does not need to be composted or made into bokashi; just cut into small pieces and apply so as to lie like mulch on the surface of the soil. Organic substances emitting odor are put in water containing seawater or water that has the salt concentration level of seawater, add seawater cultivated activated EM solution at a 1:100 ratio, and when odor disappears (it will disappear in a few days) it can be utilized as a high quality liquid fertilizer. Please remember that it is up to the competence of the people who use it to bring out the multifunctional power of salt.